Shiny and New: Robbie Williams rejoins Take That! Robbie is back with Take That, and here is their new single! The single The Flood, from the new album, Progress, produced by Stuart Price, is set to be released November 22nd. Enjoy! This song is just plain beautiful. Corny, yes, but who of you would not love someone saying this to you (luckily I have that someone, X). Bruno Mars has been nr. 1 on the Billboard Hot 100 with Just The Way You Are for 2 weeks sofar, which is a great departure from all the auto-tuned rap crap that usually dominates the charts. I love a meal that fits into one big pan! Mainly, because there's less dishes :), but also because it is so much simpler, better and faster! This literally took 15 min prep time, and it was scrumptious! With this, make the Petits Pois a la Francaise below, it's my favourite new side dish! 1.Peel and cut the onion into eighths, and put into a freezer bag with the oil, mustard, dried sage, a good grinding of pepper, and Worcestershire sauce. 2.Cut lemon in half, squeeze juice into bag, and then cut the halves into eighths and add them to the bag. 3.Squidge everything around to mix (the mustard needs help to combine) and then add the chicken pieces. 4.Leave to marinade in the refrigerator for an hour, or up to 2 days. 5.Preheat the oven to 220 degrees C, and allow the chicken to come to room temperature in its marinade. 6.Arrange the chicken pieces in a roasting tin skin side up with the marinade, including all the bits and pieces, except the lemons. 7.Tuck the halved sausages around them. 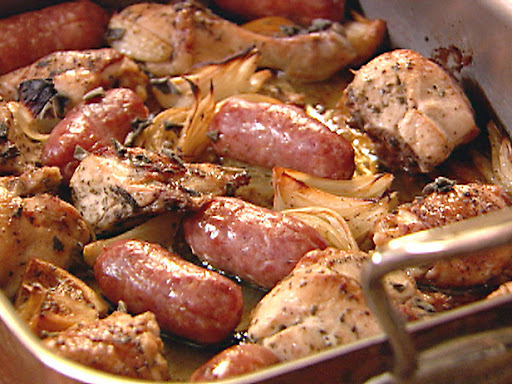 8.Sprinkle the fresh sage leaves over the chicken and sausages and then put the tin uncovered into the oven to cook for 1 hour and 15 minutes. 9.Turn the sausages over half way through to color them evenly. I've always thought peas were a little boring. This recipe changed my mind. I don't know what it is, but the subtle flavours that this recipe combines with the beautiful texture of peas, makes it a winner. This is the perfect side to any dish! 1.Saute the spring onions in the butter and oil until soft. 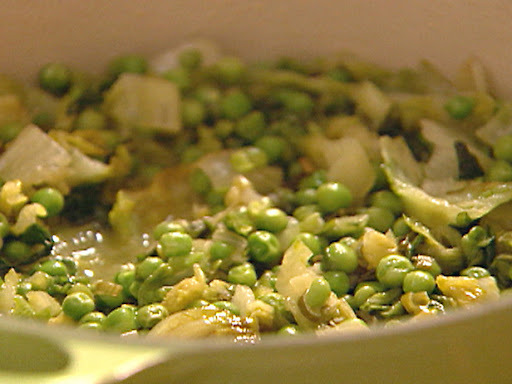 2.Stir in the shredded lettuce, and when it is wilted add the frozen peas and stock. 3.Cook at a robust simmer, uncovered, until everything is tender and the liquid flavorful and reduced. Here we have Rihanna's brand new single off her upcoming album Loud, set to be released November 2nd! I'm digging the tune, and I'm definitely happy it's not similar to the crap that was Rated R, but it's still not of the caliber of Good Girl Gone Bad. Let's hope she's got more to offer on the album! For now, i can imagine clubs going mad for this song! Don't you love listening to an album where every single track blows you away with it's amazingness! 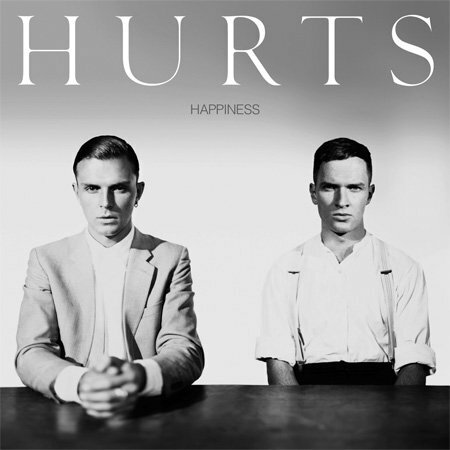 Hurts' debut album Happiness does just this. From start to finish it's a beautiful melancholic journey of epic proportions. They remind me of Keane, Depeche Mode, Imogen Heap, Lady Gaga(to a degree), and Rufus Wainwright, at their best! If you buy one album this year, this should be it. I cannot stop listening! I leave you with 2 of my favourite tracks from the album, Sunday, and Stay. To pre-order the album: Take2: Hurts - Happiness.